Termites recorded by our Termite Inspector during a termite treatment. We upset the termites once we treated them. Once we started treating the termites they started making a clicking sound and that told me we were on the mark . It is important you treat the right areas to get rid of the termites. 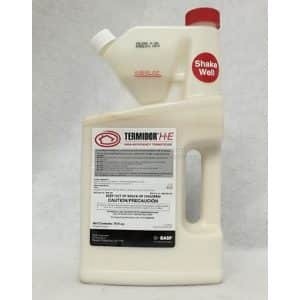 Termidor foam is our prefered way of treating the termites in the house. Turn up the sound and you will hear the termites talking to each other, sending warnings out to the other Termites. We Started recording the termites once we heard them clicking. The sound really surprised the homeowner. Have you ever heard termites? Turn the sound up and have a listen! 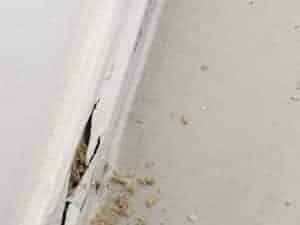 Termites were first detected during an annual termite inspection by our Termite inspector. The homeowner had bought the house only a few months earlier and had used a pre purchase building and pest inspector. He was a builder who got his termite inspection licence in one week. 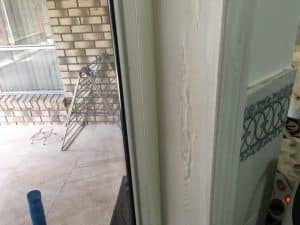 The inspector actually found some damage and said it was old damage and nothing to worry about. But in fact it was probably the beginning of the white ant infestation. Our termite inspectors had to have over 4 years experience before they got their licence. So make sure before you buy a property use two inspectors , one builder and one Termite pest inspector. Once our inspector was finished he had actually found termites throughout the whole house. If this was left for another few months the termites could have done massive amounts of damage. But luckily the termites hadn't got into the roof . The homeowner did not disturb the termites when she first noticed them which is the best thing to do. If you disturb termites they will either go to ground or move to other parts of the house. That will significantly reduce the effectiveness of the treatment as we need to get enough product on to the termites. Active termites (white ants ) found in this area . In Fact there was a Termite sub nest in the wall. The Damage to the skirting in the picture above. This is the area the first inspector said was not active. I would say he made a mistake as there was a subnest in behind the skirting and would have been very active if he investigated further. The homeowner told me he only used a tapping stick and a thermal camera and no moisture meter or Termatrac T3i. 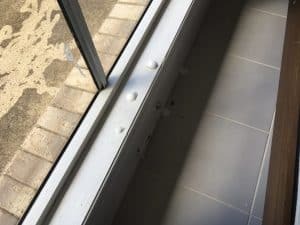 The picture of the window frame shows what to look for in your home , the white ants had only left the paint in tact in this area. The Termite treatment stage One. Once we established where the white ants were we could the start treating them. 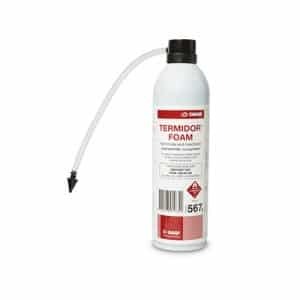 Termidor Foam Termiticide and Insecticide is a next generation Termidor product from BASF. The product has been custom designed for localised White ant treatments and provides pest controllers with unsurpassed efficacy. Termites treated with the foam will carry it throughout the colony. After a few weeks we will come back to make sure the treatment has done its job. 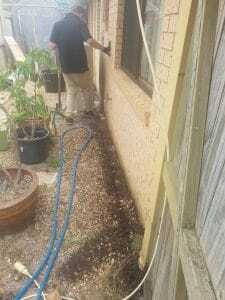 Then we move on to stage two which is the Termite Management system (Termite barrier) to stop the Termites from coming back. 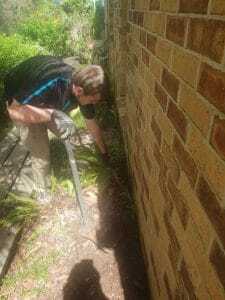 The termite barrier requires us to drill through the concrete and inject termidor at pressure. Also where the soil meets the house we have to trench 50mm below the top of the footing and drench with Termidor, then back fill and drench again. With the Termidor H E it will travel through the soil and bind to it giving the house a full perimeter Protection from termites. Make sure you get regular termite inspections and keep your barriers up to date. 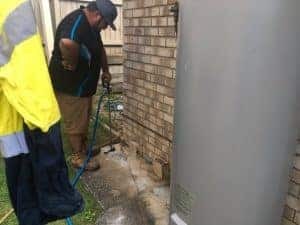 Book your Termite inspection or Building and pest inspection with Vicki or Lauren on 32008586.